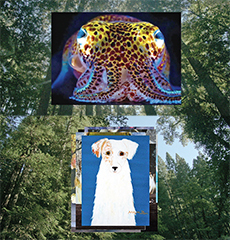 DONNA HARAWAY: STORY TELLING FOR EARTHLY SURVIVAL features Haraway in a playful and engaging exploration of her life, influences, and ideas. Haraway is a passionate and discursive storyteller, and the film is structured around a series of discussions held in the California home she helped build by hand, on subjects including the capitalism and the anthropocene (a term she "uses but finds troubling"), science fiction writing as philosophical text, unconventional marital and sexual partnerships, the role of Catholicism in her upbringing, humans and dogs, the suppression of women’s writing, the surprisingly fascinating history of orthodontic aesthetics, and the need for new post-colonial and post-patriarchal narratives. It is a remarkably impressive range, from a thinker with a nimble and curious mind. Haraway and filmmaker Fabrizio Terranova (who we hear but don't see) are clearly at ease with each other, giving the conversations—which are punctuated by images of artwork and quirky animation—a casual, intimate feel. Terranova makes playful use of green screens to illustrate Haraway's words, or to comment on them. As Haraway discusses storytelling, we see an image of her in the background, writing. When the conversation turns to her own unorthodox personal relationships and the oppressive power of heteronormativity, the redwoods out her window are replaced by a crisp suburban street. Underwater invertebrates, one of Haraway’s fascinations, float by in the background of a room.